The server has five auto-negotiating gigabit Ethernet (GbE) ports. Three Ethernet ports use standard RJ-45 connectors, and two use enhanced small form-factor pluggable (SFP+) port connectors. The transfer rates are shown in the following table. 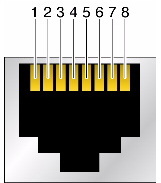 The following figure and table describe the RJ-45 10GbE port pin signals. The following table describes the SFP+ 10/25GbE port pin signals.